As part of a Blog Tour organized by Great Escapes Virtual Book Tours, I recently read Dial P for Poison, a fun cozy mystery by Zara Keane. Maggie Doyle moved to Ireland to escape her cheating ex and crumbling career in the San Francisco PD. When the most hated woman on Whisper Island is poisoned at her aunt’s Movie Theater Café, Maggie and her rock-hard muffins are hurled into the investigation. With the help of her UFO-enthusiast friend, a nun, and a feral puppy, Maggie is determined to clear her aunt’s name. Can she catch the murderer before they strike again? Or will her terrible baking skills burn down the café first? Cozy, quirky, and fun, this tongue-in-cheek mystery is a delicious introduction to the Movie Club Mysteries Series. Grab a cocktail and join Maggie as she takes her detective skills across the pond in Dial P For Poison. Maggie is a fun character. She has traveled to Ireland for some emotional R&R only to find herself investigating a murder. Once a cop, always a cop – even if she doesn’t have authority in the lovely Irish town. She can’t sit by and let her aunt be accused of murder. She is persistent and smart, and she’s confused about her feelings toward some of the locals she knew as a teen. The plot is interesting, and the story unfolds at a steady pace with a touch of humor and romantic suspense thrown in for good measure. All in all, a well-written and enjoyable cozy mystery. FTC Disclosure: I received an advance review copy of this book as part of this blog tour. This has not affected the content of my review in any way. Yes, that’s right. Two separate giveaways. 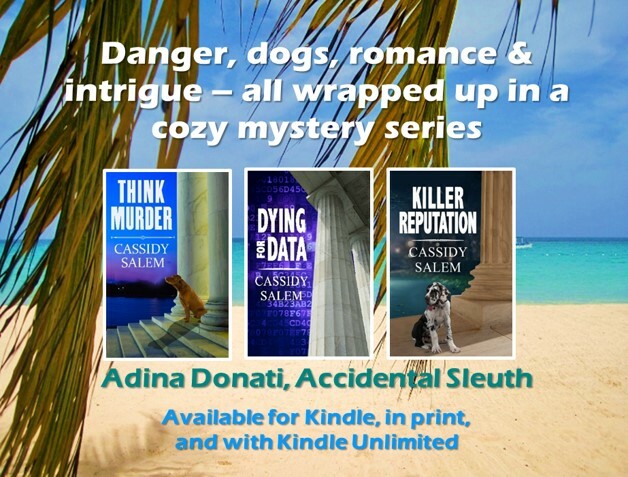 For a chance to win a box of 4 paperback cozy mysteries, 1 signed copy of Zara Keane’s ‘Dial P For Poison’, and a $100 Amazon.com gift certificate, click here to enter the Movie Club Mysteries Launch Giveaway! Leave a comment on this blog post for a change to win an e-copy (Amazon) of Dial P for Poison. USA Today bestselling author Zara Keane grew up in Dublin, Ireland, and spent her summers in a small town similar to the fictional Smuggler’s Cove, the setting of her new cozy mystery series. She currently lives in Switzerland with her family. When she’s not writing or wrestling small people, she drinks far too much coffee, and tries – with occasional success – to resist the siren call of Swiss chocolate. Sounds like an interesting read. I’ve always wanted to see Ireland. Cynthia P. You have won an e-copy. Please contact me at cassidysalem@gmail.com with your email address so that I can arrange for you to get your prize. Please contact me about your prize. Ireland sound like a great place to solve a murder! And the winner is …. Cynthia P.